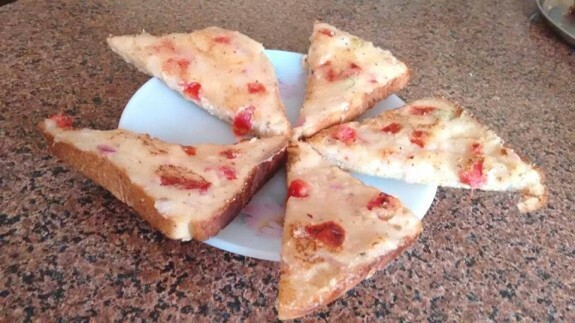 Bread Rava Toast is quick and easily made breakfast or snack recipes for full family. We always think about bread toast with butter, jam or French toast. But this unique and instant recipe will definitely be tasty and healthy to give it to your kids or family which makes you feel happy at the end. 1. Mix all the above ingredients except bread in a bowl and keep aside. 2. Now, spread the above mixture on the bread slices evenly with a spoon. 3. On a hot griddle or tava, add ½ tsp oil for each bread slice and place the mixture side of the bread down on the tava and cook well until onion tomatoes will turn light brown in colour. 4. Turnover and toast the other side of the bread. 5. You can flip once or twice if required so that the onion can be caramelized properly. 6. Remove it from tava and serve the rava/rawa bread toast hot.